So much yarn, so little time. : A strange pair...or an odd couple? 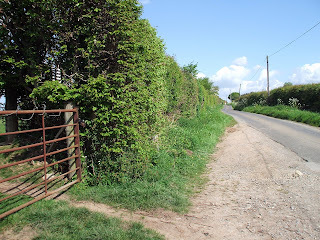 Our walk started out along a local lane, the same lane we litter-picked recently. We stood for quite some time trying to figure out the story behind this particular litter - if indeed it is litter. You probably haven't spotted it yet. Look just above the gate post. 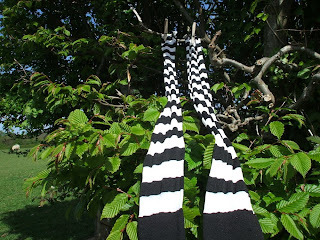 As we got closer we realised we were looking at a pair of stripy black and white stockings! 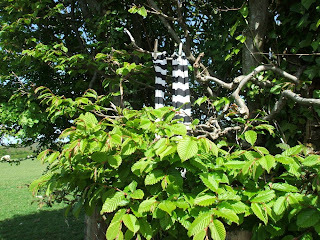 Not just a pair of stripy black and white stockings hanging in the hedge - oh no. They're PEGGED to a branch! So what do you think is the story? I can just about imagine someone getting their stockings wet in the long grass and deciding to take them off and put them to dry in the hedge, maybe while having a picnic. But who on earth takes clothes pegs out in their pocket? It's the Wicked Witch of the West of course! She didn't really melt but is roughing it in a field. so strange. it's not an empty field, it's full of sheep, so I can't imagine anyone had camped there. it's a long way from any houses, so wouldn't be washing that had blown away, and anyway it's unlikely they'd have repegged themselves! LOL at Mollimoo's response! Sounds good to me! Ha ha! My other, more sensible, thought is that maybe someone is hosting a treasure hunt where people drive around the countryside looking for clues??? mollimoo that could well be it, well done! I thought of the Wicket Witch as well. Is there a pond nearby? Maybe someone was skinny dipping and forgot part of their outfit? Someone local has heard of your blog and wants to be famous?